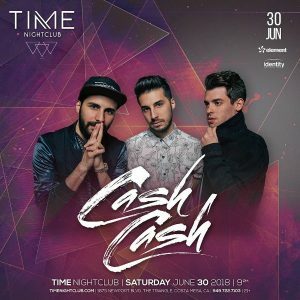 Mixing electro, pop, and dance, Roseland, New Jersey-based group Cash Cash began with longtime friends Jean Paul Makhlouf (producer, vocals) and Samuel Frisch (producer, DJ). In 2007, a more solid lineup came together when Jean Paul’s brother Alex came on board (producer, keyboards). The musicians spent a summer working inside Jean Paul’s home studio and emerged with a stack of demos, including a rough cut of the infectious dance number “Party in Your Bedroom.” They came up with the name Cash Cash in early 2008 and signed with Universal. An Internet and club hit, “Party in Your Bedroom” also found its way onto their debut release for the label, a self-titled EP that appeared in October. Following the success of that release, they also served as remixers for acts like Krewella, Capital Cities, Kelly Clarkson, and Bruno Mars. Their debut full-length, Take It to the Floor, followed in early 2009 and was supported by a package tour that also included Metro Station and Tyga.